This greenhouse was designed to manage heat and watering as inter-related processes with a minimum of cost and effort. It uses four systems to regulate heat, water and costs about $6.00 a year and needs little management. Automated systems that work well and are simple and inexpensive to operate provide significant benefits. Heat storage and cooling through water storage. Heat storage and cooling through mass storage. This system is comprised of 4 linked plastic barrels, a 1 watt pump, copper heating coils and about 170 gal of water. The water is warmed during the day as it moves through the greenhouse and cools as it moves through the heating coils in the greenhouse at night. It gives off much of the days heat at night. This system is made up from 4 inch perforated PVC pipe, a 6 watt fan, large cobbles under the beds, geotech fibre above the cobbles and two perforated pipes within the cobbles. The warm air from the top of the greenhouse is pushed through the rocks, heating them during the day, warming the beds and readmitting some of the heat during the night period. The net effect is to moderate the greenhouse temperatures. 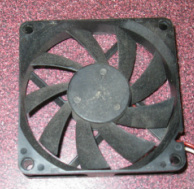 This is a fan taken from a trashed computer. Select the fan to match the PVC pipe. Cut off the corners of the fan to fit inside the pipe then wrap the outside of the edge of the fan to match the inside diameter of the pipe. 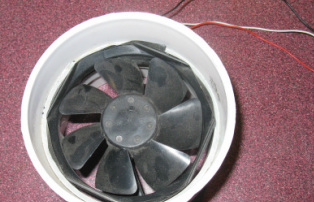 The picture to the left shows the wires from the fan are feed through a small hole drilled into the PVC pipe. Select a AC/DC adapter to match the voltage and amperage shown on the fan. I have used a four inch PVC pipe connector so the sections of the system can be fit into either side of the fan. I didn't glue the system so that I can replace the fan if needed. This system uses mister watering on a timer. The heat absorbed by vaporization of water droplets lowers the greenhouse temperature an average of 5 deg C, while meeting the plant water needs. Some additional watering is required but this is reduced to one to two times a week. This system uses gas or paraffin vent openers. This system in the override arrangement kicks in when overheating occurs. These cylinders automatically open and close the ridge vent depending on the temperature. The vents should be arranged to take advantage of convection and any possible cross drafts. These openers open wider as it gets hotter, allowing increased cooling. Don't forget to bring these in before the winter cold weather. They don't like -40 deg C.
During the last green house design class. I was asked to describe ow I made the automatic vent openers. I buy only the cylinder and make my own openers. I find then easier to instal, far less expensive and operates well. The following pictures show how I do this. The openers are made from scrap found at the metal recycle in the Mt Loren Dump. I begin with a piece of metal shelving bracket that is hack sawn along the line shown in the picture. I also use a piece of aluminium channel from an old screen door that I cut as shown and a piece rod that just fits into the end of the cylinder. After cutting the peices, I cut the rod down the middle of the long axis for about 2 cm. I then drill two holes in the base of the channel and wo holes in the gray bracket. These holes will be used to secure the apartus to the window and the window sill. This picture shows the assembled opener. The rod cut has been widened so the bracket can fit between the two halves. A small hole is then drilled through the rod, the bracket and the second half of the rod. Another hole is drilled through both sides of the cylinder holding bracket. The two small bolts that allow the cylinder to move are the placed on either side and hole the cylinder in place in the bracket. The picture to the left shows an installed vent opener using the arrangement I described above. The closer the bracket is to the window hinge, the more the movement of the cylinder will be exaggerated in the window opening. The cylinder will move about 5 cm. In this case, the window opens from the top. If your window opens from the bottom, simply change the orientation of the opener and window bracket. This was an early version, but the model I describe above works every bit as well. This photo shows how I have used a bracket and shock cord to pull the window closed. This has worked well even in heavy winds. Through the operation of this system over the past 14 years, I have found the water heat storage system to be quite ineffective and have stopped using it. The heat sink in the rocks have been by far the mose effective part of the heat management system.